The fabulous, inexhaustible, salt mines, 750 km north of Timbuktu, a sea. The landing of hundreds of camels, a shopping pilgrimage that began more than five centuries ago. Since then called Azalai, the salt caravans, which already in 1600 the Arabs haggled such as white gold, salt direct exchange with the precious metal. The caravan is formed in Timbuktu where Berabich, nomads group from Mauritania, gather the white mehari and purchase supplies for the march that will last more than 45 days to go and come back. The caravan must be self-sufficient in all. The azalai of Taudenni are formed in two periods of the year: those of Alawa that take place in the cool season between November and December and those of Tifiski in hot weather in April and May. They leave for the desert in the north charges with forage that will leave along the way for the return trip, then in Taudenni mines loaded the salt and another 20 days for the return. Even today, after the end of the war, the Afar depression remains one of the most inaccessible places on Earth, there are no roads and temperatures are extremely high. The Afar depression, also known as the Danakil, is divided between Djibouti, Eritrea and Ethiopia, is a rift valley that sinks well below sea level and has the lowest point in Africa to a -155 m above sea level here are recorded the highest temperatures of the earth with the average values ? ?of 34 ° C. From a geological point of view it is a triple junction, which is the meeting point of three tectonic plates constantly expanding, that formed the Red Sea and the Gulf of Aden, in the Afar triangle come to the surface. The only other place where a mid-ocean ridge can be studied on the surface is in Iceland. The Afar flat is slowly expanding at a rate of 1-2 cm per year. The land consists mainly of basaltic lava, here they are aligned along the rift valley 10 volcanoes in about 210 km. The best known of these is the Erta Ale, a shield volcano with a base diameter of 30 km high 500 m. In its vast caldera (1600x700 m) there are two craters. From Makalle the salt caravans descend into Dancalia along the northern slopes . 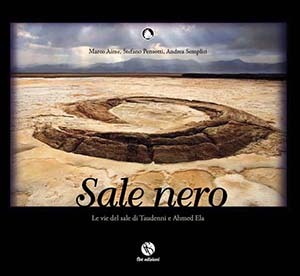 More than 2000 meters sull'altopiano Ethiopian descend into little more than 170 kilometers to the plain of salt, a blinding desert where salt is thick blanket over a kilometer. For millennia the Afar salt comes in the markets on ethiopian plateau, every day, thousands of dromedaries, mules and donkeys, between autumn and late spring, carrying 300 tons of salt. In four days of travel, the caravan reached the plain of salt, 4 kilometers before the place where the salt is extracted, stop at the village of Ahmed Ela, "Ahmed's water hole." Here spend the last night before reaching the quarry, where each caravan met the team of workers who procure salt. Le favolose, inesauribili, miniere di sale, 750 chilometri di sabbia a Nord di Timbuctù, continuano ad essere l'approdo obbligato di centinaia di cammelli, un pellegrinaggio commerciale iniziato più di 5 secoli fa. Da allora le chiamano Azalaï, le carovane del sale, che già nel 600 gli arabi mercanteggiavano come l'oro bianco, scambiandolo direttamente col prezioso metallo. La carovana si forma a Timbuctù dove i Berabich, gruppo di nomadi originari della Mauritania, radunano gli instancabili mehari bianchi e acquistano le provviste per la marcia che durerà più di 45 giorni per andare e tornare. La carovana deve essere autosufficiente in tutto e per tutto. Le azalai di Taudenni si formano in 2 periodi dell’anno:ci sono quelle di Alawa che si svolgono nella stagione fredda tra novembre e dicembre e quelle di Tifiski nella stagione calda fra aprile e maggio. Partono per il deserto verso nord cariche di foraggio che lasceranno lungo la via per il viaggio di ritorno 20 giorni per andare, poi caricato il sale altri 20 giorni per il ritorno. Ancora oggi, dopo la fine della guerra, la depressione di Afar rimane uno dei luoghi più inaccessibili della Terra, non vi sono strade e le temperature sono estremamente elevate. La depressione di Afar, conosciuta anche come Dancalia, divisa tra Gibuti l’Eritrea e l'Etiopia, è una fossa tettonica che sprofonda ben sotto il livello del mare e presenta il punto più basso dell'Africa ad una altezza di -155 m slm, qui si registrano le temperature più alte della terra con dei valori medi di 34 °C. Dal punto di vista geologico è una giunzione tripla, cioè il punto di incontro di tre placche tettoniche in continua espansione, che hanno formato il mar Rosso e il golfo di Aden, e che nel triangolo di Afar emergono in superficie. L'unico altro punto dove una dorsale oceanica può essere studiata in superficie è in Islanda. La piana di Afar si sta lentamente allargando ad una velocità di 1–2 cm l'anno. Il terreno è composto principalmente di lava basaltica, qui si trovano allineati lungo la fossa tettonica 10 vulcani in circa 210 km. Il più conosciuto di questi è l’Erta Ale, un vulcano a scudo con un diametro di base di 30 km alto 500 m. Nella sua vasta caldera (1600x700 m) ci sono due crateri. A journey into the culture of the Tibetan nomads. A maze of valleys and mountain intersected by deep gorges characterizes the Eastern Tibet, the more populated and less known Rich in tradition, inhabited by nomadic people and warriors, made famous by the writings of those few travelers who in the early years of the twentieth century went through those lands for adventure. Un labirinto di valli e catene montuose intersecate da profonde gole alpine caratterizza il Tibet più ricco, più abitato e meno conosciuto: è il Tibet orientale, ricco di tradizioni, abitato da genti nomadi e guerriere, rese famose dagli scritti di quei pochi viaggiatori che nei primi anni del “900 attraversarono quelle terre per avventura, per passione della scienza, per conoscere un mondo pericoloso e avvolto nel misterioso. Fra queste valli è stata scritta l’ultima gloriosa pagina dell’impero tibetano quando i bellicosi e indomiti Khampa, i nGolok considerati feroci predoni, gli Amdowa allevatori di yak ed ovini, si opposero strenuamente all’esercito cinese. 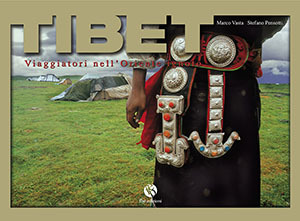 Un libro, scritto e pensato dagli autori come preziosa testimonianza da queste terre abitate da genti dagli usi e costumi che ricordano quelli del Tibet antico descritti nei racconti dell’epopea storica di Gesar di Ling. Six in the evening. A road sign indicates Ghadames. “90 km left,” groans the driver. He’s tired out. The road is good and fast. “But it’s just for this reason” he explains. The desert is calm, stillness, reflection, a state of mind… going fast is wearisome. A freshly-painted green sign shows Ghadames. I ask him to stop. “What for? There’s nothing to take a picture of.” I don’t know, really I don’t know why I am touching the sign; it’s new, brand new. Suddenly I feel a deep, ancestral homesickness. “90 km only, Ali?” He is fed up and remains silent. I jump into the car. Ali Suliman doesn’t utter a word. “Ali?….Ali?…” I call him to no avail. He lives in Nalut, on top of the Jebel Nafusah, in the new town, naturally. The old town has been deserted. I happened to see it some hours ago, a short stop during our journey from Tripoli to Ghadames. Ali took me to the interesting ‘qsar’ , the fortified barns of the Berber. “You see this amphora?” he would keep on saying, “it’s here that cereals were kept.” It’s a place burdened with memories. The cells were set one on top of the other up to six high. “And these,” he was pointing at the wooden beams stuck in the clay, “these are the steps.” I’ve only been in Libya one day and I’m already overwhelmed with memories. 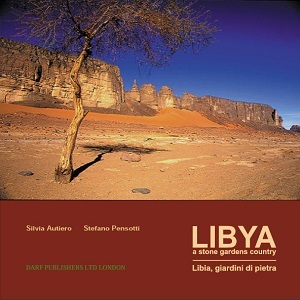 When I was in Italy, I’d been told that Libya is a country of memories. I expressed my thought to Ali, while he was showing me the violet colour inside an amphora, and he seemed somewhat angry, according to my best interpretation of a desert man’s expression. “Nalut is not a memory,” he said without another word. I apologised, even though I didn’t understand why. Not yet: I would have understood in a few days. This was the subdued voice I had been hearing inside my head since I first stepped off the plane in Tripoli. Not that I needed to apologize, my most serene Ali. But now it’s late, we’d better go. “It’s that sign,” I continued. No matter how pedantic I might look, I wanted to shake off my homesickness. “What about that sign?” Ali pays attention to me again and adds, “It’s brand new”. I assumed that it was just the contrast between the new and the writing of Ghadames – the pearl, the mythic and desired oasis for so many caravans – that confused me. But was the contrast real? Ali would say no. It was only a sign, telling us that it was 90km to Ghadames, and we were going in the right direction. In addition, the sign was useful, the newer the better. I was sure Ali would have answered like that, instead, all of sudden he points to the clouds: “Look at them carefully, they are leaden, still. There is silence. It seems that the sky holds its breath”. I keep silent, listening too. Ali stops the car; he gets out and sits on the sand, his eyes staring beyond the horizon. I’m confused, even embarrassed. All around the silence, a prelude to something about to happen, I think for an instant. But then I understand that it is like a presence, the silence like life, like breath. The clouds were there, mute, icy, dark and heavy. I wish some thunder or lightning, would break that silence, which reverberated like a scream to me. sleeping giant is turning red, pink, blue. Listen before it fades and silently makes way for the night. Sei della sera. Un cartello indica Gadames. -Ancora novanta chilometri- si lamenta l’autista. E’ stanco. La strada è buona e permette di correre, -Ma è proprio per questo- spiega lui. Il deserto è quiete, immobilità, riflessione. Lui quel ritmo ce l’ha nel sangue. A correre si sfinisce. Gadames. Gadames in un cartello verde riverniciato da poco. Gli chiedo di fermarsi, si arrabbia. -Che c’è da fotografare?- Chiede esausto. -Niente, è solo che…- in realtà non so cosa sia, perché io stia passando la mano su quel cartello. E’ nuovo. Nuovo di zecca. D’un tratto una nostalgia profonda, vecchia, ancestrale. -Soltanto novanta chilometri, Ali?- Non mi risponde neppure tanto è stufo. Salto in macchina. Dapprima Ali Suliman non mi parla. -Ali?- Faccio all’autista. -Ali?- Lui abita a Nalut, in cima alla scarpata del Jebel Nafusah, nella città nuova naturalmente. La vecchia è abbandonata. L’ho vista qualche ora fa. Breve sosta nel percorso da Tripoli a Gadames. Ali mi ha accompagnato all’affascinante qsar, granaio berbero fortificato. -Vede quest’anfora?- Continuava a dire ad ogni angolo. -E’ qui che stipavano i cereali-. E’ un luogo carico di memoria. Le cellette sono sovrapposte per un’altezza di sei piani. -E queste-, diceva indicando le travi di legno conficcate nell’argilla, -queste sono le scale-. Non ero in Libia che da un giorno, che già essa mi assaliva con i suoi ricordi. Me l’avevano detto prima che partissi dall’Italia, che la Libia era un paese di ricordi. Lo dissi ad Ali, mentre mi mostrava l’interno di una grossa anfora dalle venature viola. Si indignò quasi, per quel che posso capire dell’espressività di un uomo del deserto. -Nalut non è un ricordo-. Disse così e non aggiunse altro. Mi scusai, anche se ancora non sapevo esattamente bene di che. Non ancora, ma l’avrei capito, di lì a pochi giorni. Una voce sommessa si stava facendo strada dentro di me. Forse già da quando avevo messo il piede a terra all’aeroporto di Tripoli. Non c’era bisogno di scuse, mi tranquillizzava Ali, e comunque era davvero tardi. Dovevamo andare, o avremmo fatto tardi. - E’ quel cartello -. Continuo io. Il desiderio di scacciare quella strana nostalgia mi stava facendo diventare pedante. Cos’ha che non andava quel cartello? Mi dà finalmente retta Ali. -E’ nuovissimo-. Aggiunge. Compresi che era proprio quel contrasto a destabilizzarmi: un cartello stradale con una sfacciata patina di nuovo e quella scritta, Gadames, la perla, la mitica, l’agognata oasi di chissà quante carovane. Ma davvero c’era contrasto? Ali mi avrebbe risposto di no. Quello era solo un cartello e mancavano ancora 90 chilometri a Gadames. E noi stavamo andando proprio lì. E poi il cartello è una cosa in più, non in meno. Serve, ed è meglio se è nuovo. Avrebbe detto proprio così, ne sono certissimo, se gli avessi spiegato del contrasto. Invece tutto a un tratto mi indica le nuvole. -Guardale bene-. Mi dice. Sono plumbee, pesanti, ferme. C’è silenzio. -Sembra che il cielo stia trattenendo il respiro-, dico. Poi, finalmente, rimango zitto anch’io. In ascolto. Ali ferma la macchina. Scende e senza una parola si siede sulla sabbia, gli occhi fissi oltre l’orizzonte. Io rimango per un po’ così, imbambolato, incerto sul da farsi. Provo un lieve imbarazzo. Tutt’intorno un immenso silenzio, preludio di qualcosa, penso per un attimo. Non è così. Quel silenzio, eterno, vive per se stesso, respira, è presente, vivo. Adesso. Le nuvole erano lì, mute, glaciali, impenetrabili e cariche. Avrei voluto che un tuono o un fulmine lacerassero quel silenzio che stava diventando un urlo. Il deserto è una traccia. Il deserto si snoda sotto i miei occhi. Mi abbandono ai colori. Caldi. Alla sua voce fatta di silenzi. Alle sue pietre, ai suoi granelli di sabbia. "tamerici fossili" leggo sulla mia guida. Segni. Passaggi del tempo. Fossili.